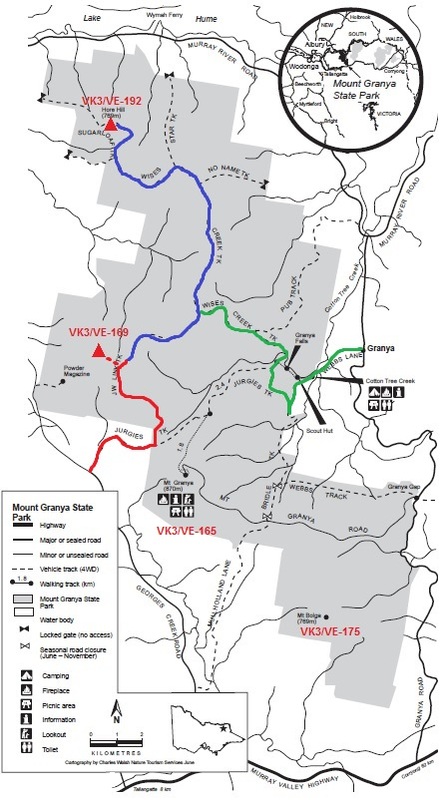 A few weeks back my Lady and I activated Jarvis Creek Plateau, VK3/VE-208, and on the way down from that one we noted that there were a couple of Summits in the adjoining Mount Granya State Park that we hadn’t yet visited. 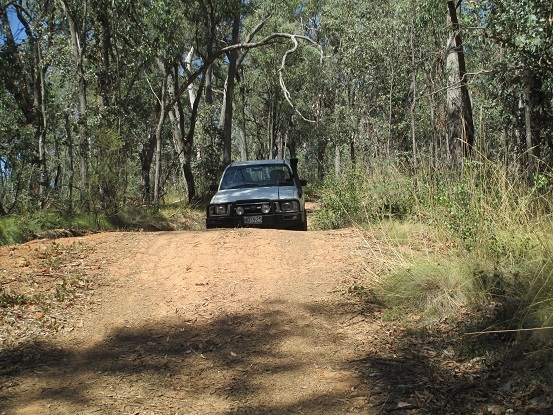 We’ve done Mount Granya itself a couple of times since it’s a very easy one to get to and hence great for testing equipment and antennas, but there are actually four Summits in the park and some interesting 4WD trails that connect them, so an expedition was in order. We chose the unnamed Summit VK3/VE-169 and Hore Hill, VK3/VE-192 for this trip, leaving Mt Bolga, VK3/VE-175, for a future expedition. A check of the topo map showed that there were a couple of ways we could approach the two Summits. We decided we’d approach from Georges Creek Rd, using Jurgies Track and the JW Link Track to get close to VK3/VE-169. Then we’d follow the JW Link Track, Wises Creek Track and Sugarloaf Track to Hore Hill. On the way out we’d follow Wises Ck Track to the Bridle Trail and exit the State Park at the Cotton Tree Creek camping area. On the map, the red line shows our route in to the first Summit, the blue goes from there to Hore Hill and the green shows the way out. We had not visited that part of the park before and had no knowledge of the state of the trails, so we allowed plenty of time to make the trip. That was just as well, as you’ll see. We found Jurgies Track where it turns off Georges Creek Road and winds through farmland for a kilometre or so before meeting the State Park boundary. There are a couple of (unlocked) gates to negotiate and stock wandering around so care is required here. Once inside the Park, a track goes off immediately beside the gate and we took this, mistaking it for the JW Link Track. Of course it wasn’t, and after a very bumpy, twisting and turning ride we arrived at the old powder magazine. Oh well, never mind, we’d wanted to visit that anyway! So we circumnavigated it and on the way back out we noticed another trail leading up the hill which wasn’t shown on the topo map but which the GPS indicated went in the direction of the Summit we were looking for. What the heck, we thought, we’re here and we’ve got plenty of time so why not check it out? It went a couple of kilometres into the bush and then petered out, or perhaps it would be more accurate to say that the gaps between the trees closed up to the point at which I couldn’t squeeze the Hilux between them, although you could probably have got through on foot. We retraced our wheel tracks back to the gate and went on up Jurgies Track. What can I say about Jurgies Track? Well, once you’re through that last gate it becomes extremely steep and there are some of those ferocious “speed humps” that would be impossible to negotiate in a vehicle that doesn’t have high ground clearance. The surface is clay filled with loose stones so that it is most definitely dry weather only, no matter what you’re driving. I put the Hilux in low range going up that hill, to give me a bit more control. My advice: this one is 4WD only. At the top of the hill we found the JW Link Track, neatly signposted so you can’t miss it. We followed it until the GPS told us we’d reached our closest point to the Summit, which was a very short and easy stroll through relatively open bush. There were plenty of suitable trees to hang the dipole from, so we were set up and on the air in about ten minutes. As we’d allowed plenty of time we were only about ten minutes later than I’d anticipated in my Alert, despite the misguided tour of the powder magazine! I started on 7MHz SSB as usual, quickly contacting VK2CCW, VK2GAZ, VK2JI/p (S2S), VK2LAX/p (S2S), VK3FD, VK3AFW, VK3FQSO, VK3CAT, VK3PF, VK3WRL and VK3IL/p before the UTC roll-over. I continued and contacted VK3BYD, VK3PF, VK3CAT, VK3FD, VK3WRL, VK3AFW, VK3ZPF/p, VK3IL/p, VK3YN, VK2IO, VK2YK, VK2LAX/p (S2S) and VK2JI/p (S2S) after the roll-over. As I had plenty of time I went on to 14MHz CW where I called CQ for ten minutes with no takers, despite posting a spot announcing my presence. Undaunted I changed to 10MHz CW, put up a spot, and eventually got a call from VK2DAG – thanks Matt. Satisfied with the haul, we quickly packed up and hit the trail, heading for Hore Hill. Wises Creek Track is well defined but in some places there are deep wash-outs and there are plenty of huge speed humps to negotiate. We took it slowly, leaving the box in low range so I didn’t have to keep swapping up and down. All the trails we passed were well signposted so it was very easy to find our way around. The Sugarloaf Track leads directly across the Summit of Hore Hill so you can drive all the way to the top of this one, but be warned. The final 300m of the trail below the Summit is very badly washed out, with deep ruts and large exposed rocks to pick your way over. 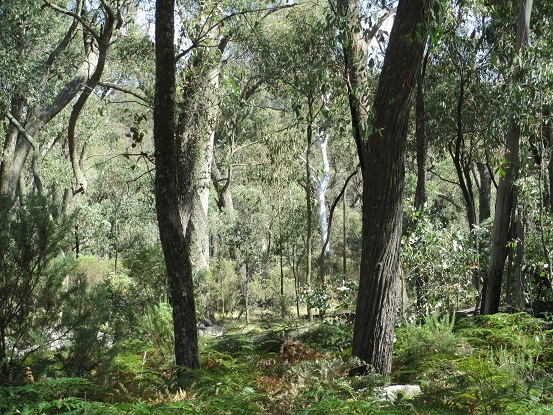 The Summit of Hore Hill is very clearly defined, with views through the trees down across the Murray Valley. There are plenty of trees with suitable branches to serve as antenna supports, so we rigged up the standard link dipole configuration. We decided to eat our lunch before beginning the activation, so I left the FT817 lurking on 7.090 while we ate. It was quiet for a few minutes until VK2LAX/p popped up, activating his second Summit of the day, so I quickly made contact with him followed by Ed, VK2JI/p on the same summit. After that it was on for young and old, as the saying goes, and after a quick QSY I made contact with VK2FGJW/p (S2S), VK3BHR, VK1NAM, VK3FQSO, VK3PF, VK3ZPF, VK1DA/p (S2S), VK3AFW, VK3CAT, VK3BYD, VK1DI, VK2ZRD and VK3ARR. Not giving up on CW I went down to the lower end of the band and contacted Wayne, VK3WAM/p for a S2S on the key. Delighted with this contact I persevered, calling CQ for a while until Ron, VK3AFW took pity on me and gave me a call. So that made three CW contacts in the day – not fantastic but better than none at all! We’d done enough for one day, we thought, so I put the rig back on 7.090 and retreated to have a well earned cup of tea and a scone. Naturally, I had my mouth full when VK3VTH came up calling CQ, so I quickly munched my way through that and gave him a call. Contact completed I went back to my tea and scone, only to repeat the performance with VK3MRG/p for the final contact of the day. 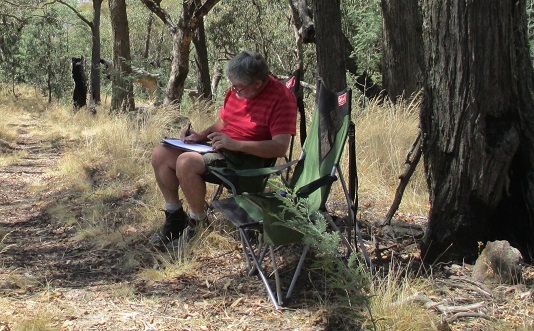 VIC State and National Parks tend to have well signposted trails. If a trail doesn’t have a sign, check very carefully before you assume it’s the one you’re looking for. CW is a fantastic mode but if you’re the only one using it you’re in for a lonely time! If you allow plenty of time to get to your Summits you won’t get stressed about being “late”. 4WDing takes time, unless you don’t care what you do to your vehicle.